It might be time to pull the plug, even if she doesn't seem to be watching. Parents, if nobody is watching the TV, please turn it off. Researchers who conducted a national survey of kids' exposure to TVs droning on in the background say, "The amount of exposure for the average child is startling." How much is it, exactly? Try just under four hours a day for the typical kid. So why care about a TV that nobody seems to be paying attention to? Well, the researchers write, background TV may lower the quality of interactions between parents and kids, lower kids' performance on tasks that require real thinking and drain kids' attention during playtime. The findings, published in the latest issue of Pediatrics, come from a telephone survey of more than 1,400 English-speaking households conducted in early 2009. The researchers asked people to go through the activities of a typical day, noting whether a TV was on while the child was doing something. Kids living in single-parent homes were exposed to more background TV than those in two-parent households. 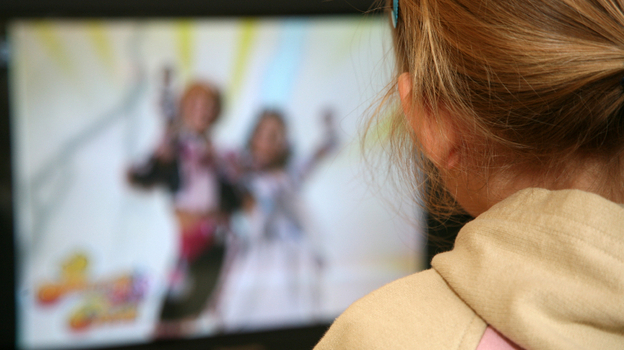 Children in the poorest households were exposed to the most background TV. Infants and toddlers were exposed to more background TV — 5 1/2 hours compared to 2 3/4 hours for kids aged 6-8. Pediatricians say the littlest kids — those 2 and younger — shouldn't watch any TV at all. Older children should spend no more than 2 hours a day plopped down in front of a computer, TV or other device with a screen. The researchers behind the latest study suggest that it might be best for doctors and parents to concentrate on reducing the TV exposure of kids under 2, since they should watch the least and are being exposed to the most. The work was funded by a grant from a cooperative agreement between the U.S. Department of Education and the Corporation for Public Broadcasting.